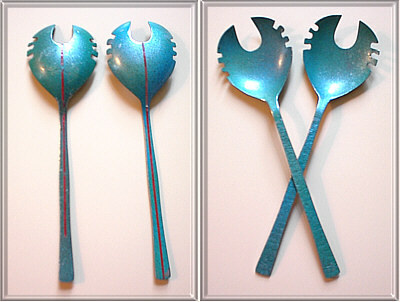 "The Greatest Show in the Galaxy"
These two spoon props were used in the production of the Doctor Who story "Time and the Rani" staring Sylvester McCoy as the Doctor and Bonnie Langford as Mel. This 24th season, four part serial (7d) was first transmitted on 9/7/87. They were used again in the 25th season for story "Greatest Show in the Galaxy", again staring Sylvester McCoy but this time with Sophie Aldred as Ace. Another four part serial (7j) that was broadcast on 12/14/88. 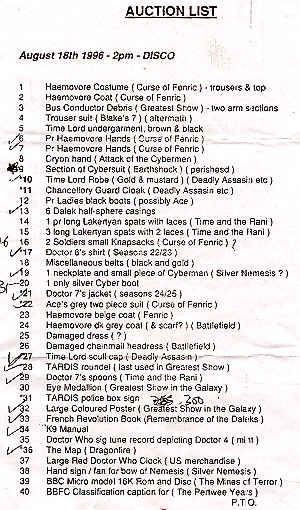 The Spoons became a trademark item of the 7th Doctor along with his question mark umbrella. 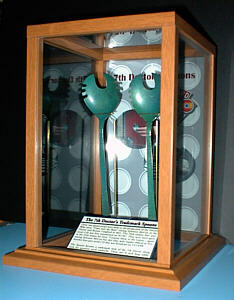 These two 8 inch long oddly shaped pieces of flatware are a very unique and special part of Doctor Who history. 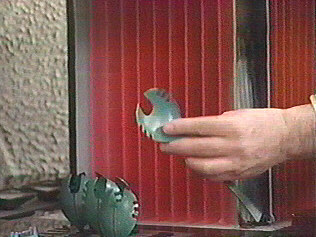 Originally intended as futuristic hightech tools in the evil Rani's tool box, the Doctor uses them to display his vaudevillian skills.The Doctor takes two of the sonic tools from the tool box and plays a lively tune all over the Rani. After an intergalactic junk mail robot materializes in the Tardis console room advertising the Psychic Circus. Ace agonizes over attending while the Doctor brushes up on his spoon playing act hoping to audition. 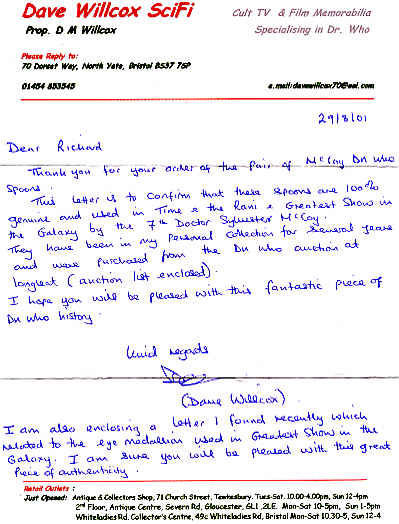 The spoons were purchased by Dave Willcox of Bristol in the UK from the Doctor Who auction at Longleat in 1996 (item 29). They remained in Dave's personal collection until I bought them from him in August 2001. They now reside in my collection located in Virginia, USA. The spoons are item 29. I made the display case using a five sided glass retail box that sits on a fixed pedestal. I constructed a custom brass rack that holds the spoons with very little intrusion. 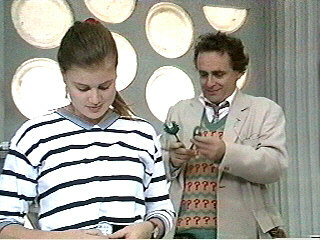 A backdrop was added sporting the traditional Tardis roundels and two pictures of the spoons in use by the Doctor. A narrative card on foam core board sits at the bottom of the spoons describing their heritage.